Plus, the more steps there are that can lead to distraction, the more likely I am to fall into the time consuming abyss. Surely I am not the only one who gets distracted when I go to do something on Facebook? You're with me there, right? When you are treating you blog as a business, in order to join the ranks of for profit bloggers, systems and efficiency are your friend. Just like deleting those pesky themes that always want to be updated, today's tip has you taking a minute or two up front that can save you oodles of time in the future. 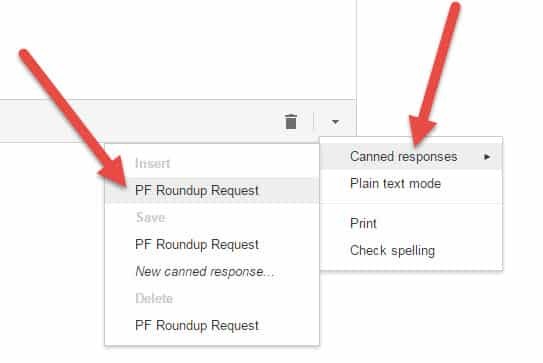 We're going to cover a ridiculously easy way to speed up your blogging emails using Gmail's canned responses. This is the kind of blogging tip that we *love* to share over here at For Profit Blogging. Think of all the times as a blogger that you send out virtually the same email, over and over again. Did you know that you don't have to type everything out? Completely for free, you can very quickly drop in pre-written text, give it a quick edit if needed, then send. Fast and free, what's not to love? Get a head start on your own email templates. Download your copy of five email templates here. Today's blogging tip is something I should have implemented literally years ago. It is really very easy, but I had never come across a tutorial for it before. Don't be like me! As soon as you see how quick this is to implement, you'll be making yourself canned responses all the time. If you're not sure how to utilize this blogging hack, we've got some suggestions to help speed up your blogging. By following the tips at the end of this post, you can even use this as an opportunity to build your traffic and come across as even more professional than you already do. Even better, sign up to download our 5 Free Email Templates to Make You a Faster Blogger which you can customize and use yourself. Of course every blogger has their own frequent flyer email questions, this list is far from complete! We've taken five of these and written email templates up for you to use. A big shout out to Hank from Money Q and A and Pauline from Reach Financial Independence for contributing to the list of ideas. But first, let's get into the nitty-gritty, easy-peasy set up steps. This will only take a moment and you'll be wondering where they've been all your life! 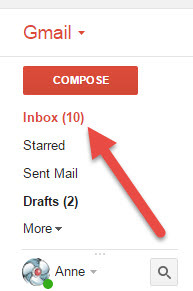 Click on the gear icon in the top right hand corner of your Gmail account and then click Settings. Yeah, I'd never heard of it before either! Scroll down a bit until you find Canned Responses and click to Enable. This next step is important! Scroll back up to the top and click Save Changes. Now we're going to flip back to our inbox by clicking Inbox on the left hand side of the screen. Next, compose the email that you would like to use as your template (or use one of the 5 free email templates to make you a faster blogger). I recommend using “Hi there” or “Howdy” as a generic reply that doesn't ooze generic (not too badly, anyway). Don't worry that the exact wording has to be what you are going to use every single time. The canned response allows you to insert the text into the body of your email when you go to use it and then edit it, as if you had written it out just then. Side note, if you are interested in the tips for Pinterest traffic, go check them out. To save your draft as a Canned Response, click on the down arrow in the bottom right hand corner of your editor. 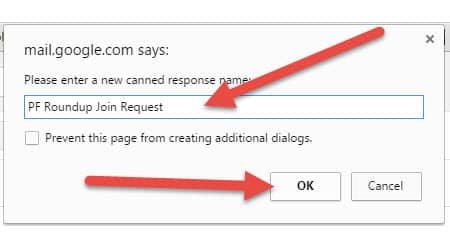 Hover on Canned Responses, then click New Canned Response. 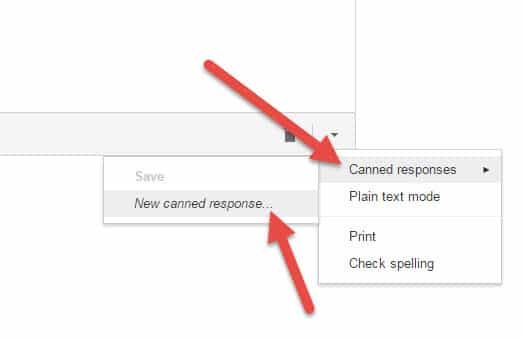 This will create a pop up where you can name your new Canned Response then click OK to save. Woohoo! Now you have a canned response ready to go. How do you use it, you ask? Open a new email, or click reply, then go back to that little down arrow in the bottom right hand corner. Hover on Canned Responses. Now that you have one saved, you will see three options: Insert, Save or Delete. The titles are greyed out and a tad hard to read. Click to insert the name of the Canned Response you wish to edit. It will now appear in the body of your email. Uhoh. Things have changed and your old email just isn't what you want to say anymore. Open an email and insert your existing Canned Response. Click on the down arrow and delete that Canned Response. Make edits to your email. Click on the down arrow again and save the new Canned Response, using the same name you did last time. Why bother to add the delete step? So you don't accidentally use the old email by mistake! Honestly, reading this tutorial probably took longer than setting up your first canned response. From now on, you have the keys to speed, my blogging friend. Now this is the best part. Not only do canned responses make you a faster blogger, they can also increase your page views and professionalism! Looking like a professional is half the battle. Read on for our tips to get the most out of your template emails. Include links to relevant material. Try to include a link to something in each of your canned responses. You can increase your page views and prove that your blog provides value. Link using words, not URLs (something I should have done in the template). Insert hyperlinks into your emails by selecting the text you want to link and pressing Ctrl + K. This makes your emails look more polished. Write them in your voice. Just because it's a template doesn't mean it has to be boring and generic! Edit and refine your responses over time. We all get more refined over time, so make sure that your templates are linking to your most relevant resources and contain the most up to date information. Use canned responses even in emails that require a lot of personalization, to speed up your responses. Use the canned response for 1/3 of your email and write the remaining 2/3rds yourself. Want to step up your email game? Download the five free templates below.